When patients receive medical care, they place their lives in the hands of doctors, nurses, technicians, and other healthcare providers. They hope that the treatment they receive is careful, proper, prompt, and successful. In the majority of cases, it is. But sometimes doctors and other healthcare providers fail to exercise the care that an ordinary doctor or healthcare provider should, with devastating results. For instance, all too often doctors and other healthcare providers cut corners, improperly diagnose a patient's condition, delay in diagnosing a patient's condition, fail to refer for a test or study, mistreat injuries and ailments, make errors in the type or amount of medication prescribed, perform the wrong surgery or surgery on the wrong body part, or make other mistakes during surgery such as leaving surgical instruments in a patient's body, and otherwise provide substandard care. The results of these errors can be tragic. The National Academy of Sciences' Institute of Medicine estimates that as many as 98,000 people die each year because of mistakes by medical professionals. As a board-certified physician, Dr. Aussprung has a sophisticated understanding of the complexities of the human body. He understands how the body functions and how its many diseases and injuries should be diagnosed and treated. He also has an intimate knowledge of the duties doctors and other healthcare providers owe their patients, as well as a personal understanding of how hospitals function. He is able to use his medical expertise to determine when a death or injury is the result of carelessness or other forms of malpractice by the doctor, nurse, or other healthcare provider. and failure to inform about and treat HIV. In the 2006 Hook case, Dr. Aussprung won a $2.7 million verdict in Scranton (Lackawanna County, Pennsylvania) for the family of a woman who died from a bowel perforation and delay in diagnosing and treating an abdominal infection (sepsis) following elective surgery. This was the largest verdict ever in a death case in Lackawanna County. In Pittsburgh, Dr. Aussprung obtained a large, confidential settlement for a brain injured premature infant. The claims in this case involved a pregnant woman with a known placental tear who was not properly monitored during labor and then had forceps improperly applied to the baby resulting in the infant suffering a skull fracture. In Philadelphia, Dr. Aussprung helped obtain a large, confidential settlement for a brain injured 68 year old woman who received inadequate antibiotic treatment following brain aneurysm surgery. She developed a brain infection, which progressed and left her severely disabled. Also in Philadelphia, Dr. Aussprung litigated and helped obtain a confidential settlement in the case of a five year old child with leukemia who was over-transfused with blood during a surgical procedure and died. Another Philadelphia settlement involved a teenager with diabetes who was severely brain damaged at three years of age when timely diagnosis and treatment failed to occur. In an Indiana County case, a large settlement was obtained for the family of an infant who died from a delay in diagnosis of meningitis. In Clearfield County, Dr. Aussprung was involved in the settlement of a case involving a child whose seizures were not properly treated and had improper I.V. fluid management. In Chester County, a settlement was obtained when a woman's deep vein thromboses (DVTs) were not properly treated, resulting in her death. In York County, large settlements were obtained for twin children who suffered injuries at birth and necrotizing enterocolitis (NEC). 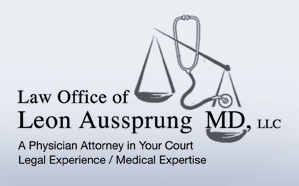 If you think that you or a loved one may have been the victim of medical malpractice, contact Dr. Aussprung today.